The Xyron Creative Station for your cardmaking needs. 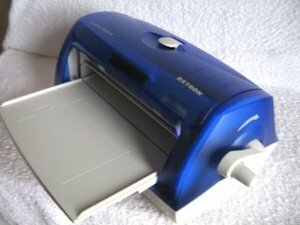 The Xyron Creative Station is not a necessity but it is a useful addition to anyones craftroom. So when I was offered one as Christmas present...what could I say but ..."Yes please!" Well it would have been rude to refuse such an offer wouldn't it? It was more of an "I want one of those ... " piece but it will save me some time in my cardmaking. I like to apply ribbons and gemstones, flowers and flourishes to my creations and all of these will go through the machine and then can be added directly to the card. ...and when they have emerged at the back of the machine you use the integrated cutter to cut the paper, remove the clear film and use wherever you want. Simple! 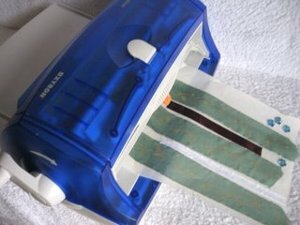 The adhesive cartridge can be easily removed and replaced by a Laminating one, to laminate your photographs, certificates, business cards or anything else you may want to do. Xyron have several different machines to suit most of your glueing needs. The one I have is the size to run A4 papers through as I thought that this would suit my needs as a cardmaker the best. I was very pleased to get my Xyron Creative Station and I look forward to putting it to good use in the future. There is also smaller version in the shape of an X and this one is ideal to sit on your work top for any sentiments of small flowers that you may need to add.